Earlier in the year I was asked by Mike from The Studio Commissary to make an exclusive to sell on the doll board in March. I was so excited! I had so many fashion ideas running through my brain that it was really hard to decide which outfit to make. I finally chose this one. 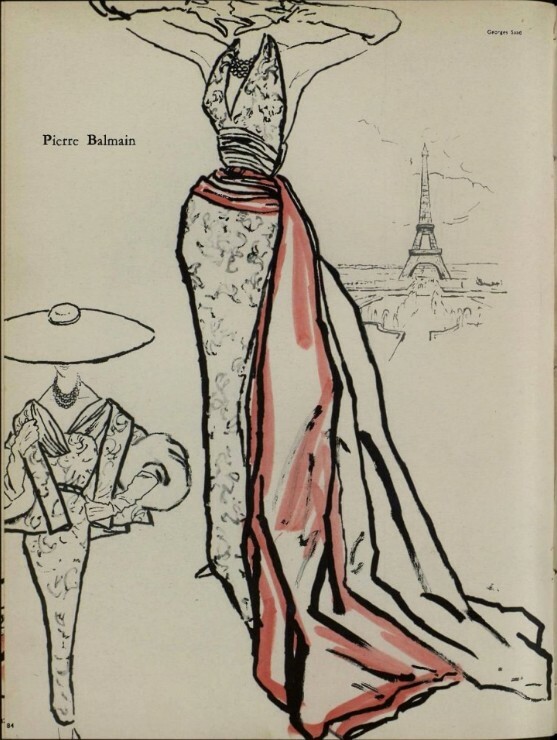 I adore this 1954 Pierre Balmain creation. 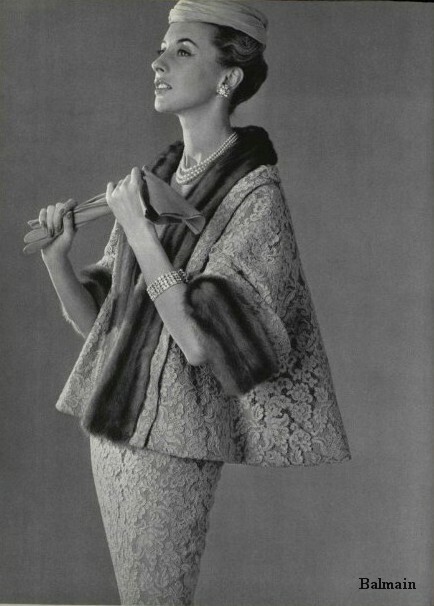 When I first saw this picture in L'Officiel de la Mode, I knew I had to make it someday. Originally I thought it was a skirt and jacket, or a basic sheath. Then I one day was going through another French fashion magazine, L'Art et la Mode, and I saw this picture. Wowsers! I was so glad that I had found this photo before I had attempted making the outfit. I love the chiffon neckline. I also found this picture in the same magazine. I like this version too, without the fur collar. 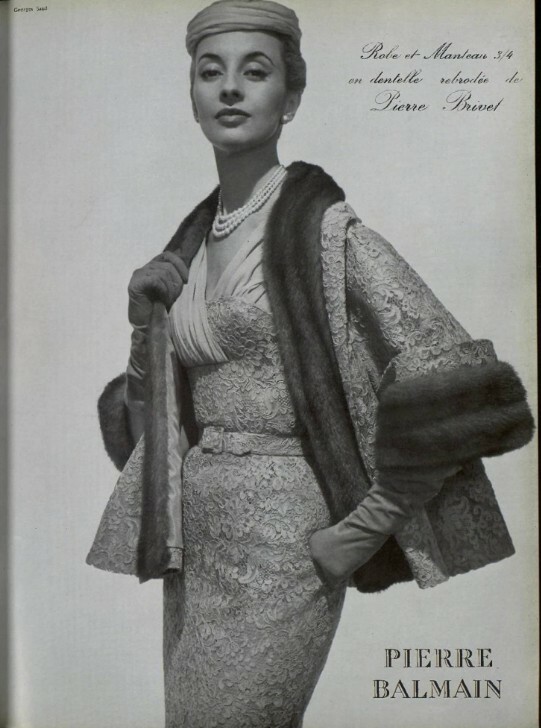 I though about making the fur collar on my jacket detachable with an additional lace collar under it, but I didn't have enough lace to do it and I thought it might make the neckline of the jacket too bulky. I may try it later though. I had bought the grey lace a long time ago with no plans for it in mind. I had to shop around though to find the grey fur. I was so excited to use my Eiffel Tower backdrop. But alas, the lines are all crooked, I will have to make sure that everything is lined up better next time. I do like the greys of the suit with the greys of the backdrop. My restyled Oona demanded to be my model for this fashion. I love this backdrop too. I was able to squeeze out 6 of these outfits to sell on The Studio Commissary. They were a hit! They sold out in the first few minutes. I plan to make more of these suits in other colors later this year. When I went to make the pattern to sell, I decided I loved this bodice so much that I wanted to see what it looked like as a cocktail dress. I had some lace scraps left and was able cut out quite a few lace bodices. I sewed a chiffon skirt to the bodice and Tah-Dah! An adorable cocktail dress! Rondolette looks lovely in this dress. This will be the first time that one of my patterns will have two different options. WOWOWOWOWOWOW!!!!!! You 've done an amazing JOB DIANE!!! LOVE IT!!! Oh my goodness, your dresses are AMAZING!!! I'm a new follower... my girls could only dream of owning such dresses! !